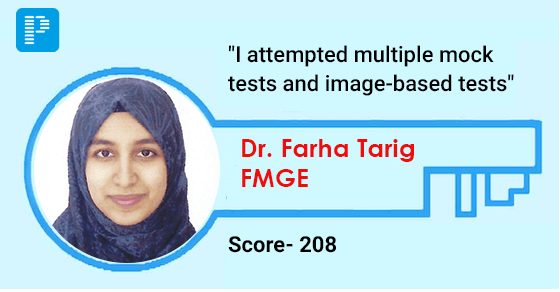 PrepLadder congratulates Dr. Farha Tarig on clearing FMGE Dec 2018 exam. We wish him all the very best for his career and future ahead. In this exclusive interview with PrepLadder, she shares her plan that worked best for her to help score well in FMGE. My name is Farha Tarig. I graduated in July 2018 from Zhengzhou University, China. I scored 208 in the December 2018 session of FMGE. What do you think is the correct approach to study for FMGE? Only MCQ's or Theory+ MCQ's? I think the best way to prepare is Theory + MCQ ’s. This is how I prepared and it worked for me. Solving MCQ’s shows you the gaps in your knowledge and then once you pinpoint your weakness, you can work on your theory in that particular area. Dedicate the last 2 months for revision and practice, as that is the most important part of your prep. Spaced repetition is the key to cracking this exam. With this exam, you’re supposed to remember a whole lot of facts and basic concepts and they won’t stick with you until and unless you constantly revise. Yes, it did play a part. I would solve the MCQs and I attempted multiple mock tests and image-based tests. This helped me better my test taking strategy and showed me my weak areas. I was a topper in medical school. The hardest ones were Biochem, Pharmacology, and PSM & the easiest ones were Pathology, FMT, Microbiology. Don’t skimp out on attempting MCQs just because you feel that you haven’t finished reading the theory. Don’t make the mistake of doing just a few questions. Solve as many MCQs as you can in the months leading up to the exam. Aim for 2 mock tests per week and challenge yourself to get a higher score each time. Identify your weak areas and work on them. And on the test day when sitting for the exam, take it easy and attempt the questions as best as you can. We thank Dr. Farha Tarig for sharing her success story.